Radio Dispatcher Greg Krikava retired from Midway on Feb. 21, 2017. 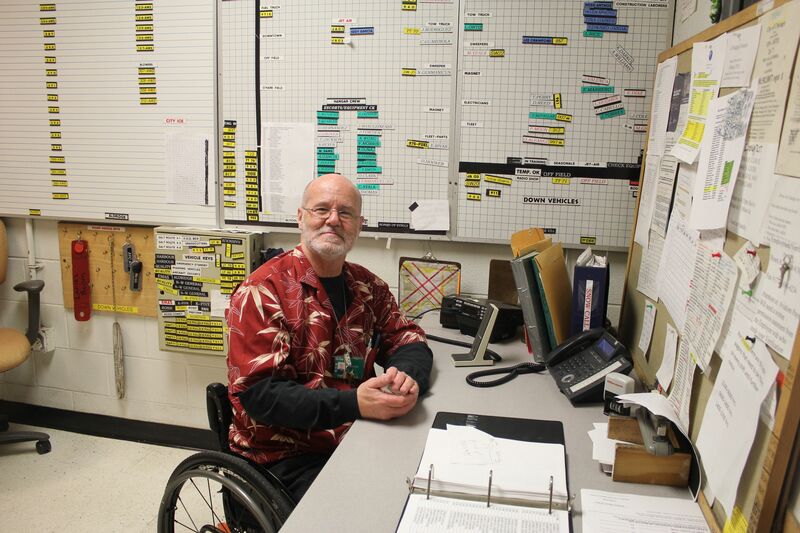 On his last day of work as the radio dispatcher for AMC at Midway airport, Greg Krikava sported a red and white Hawaiian shirt and parked his wheelchair in the main hall to welcome everyone to his retirement party. Cheers and jeers could be heard from down the hallway and into the hangar from Greg’s co-workers and some retirees that came just to celebrate their friend. Greg started working in Aviation in 1979 at O’Hare as a driver. Nearly 20 years later, he was diagnosed with multiple sclerosis and when it was apparent that Greg would not get his regular mobility back, the Teamsters and his fellow colleagues advocated for him to keep a job in Aviation. Since Midway did not have a radio dispatcher, it became a newly created position just for Greg. He has been the only Midway radio dispatcher since 1999. While the news of Greg’s upcoming retirement spread to his fellow co-workers, they began pooling their money to throw him a big party on his last day. Everyone gathered in the conference room upstairs and food was brought in from pizzas and sandwiches to homemade tamales and rice from some of the workers’ wives. During the party, a few people stood at the front table with Greg to say a few words and present him with gifts, including a special “radio dispatcher parking only” sign that had his name on it. Midway Operations Deputy Commissioner Costas Simos also presented Greg with a gift: his own runway blue light that was inscribed with a ‘thank you’ message. “Every time I come here the first kind words I hear come out of Greg,” said Local 700 Business Agent Carlos Sanchez. “There’s not a soul in this room that can say anything bad about this guy.” Everyone in the room proceeded to give Greg a standing ovation.